It wasn't really until I had unwrapped this recent on-line purchase from his bubble wrap and held him in my hands that I fully appreciated the sheer scale of Mattel's classic 1976 action figure - Pulsar aka The Ultimate Man of Adventure. Measuring 14 inches tall from the top of his head to his chunky clip-on boots, he positively towers over his contemporaries like Action Man or his most obvious rival on toy store shelves, Kenner's hugely popular Six Million Dollar Man figure of Steve Austin, a pip-squeak at 12 inches. 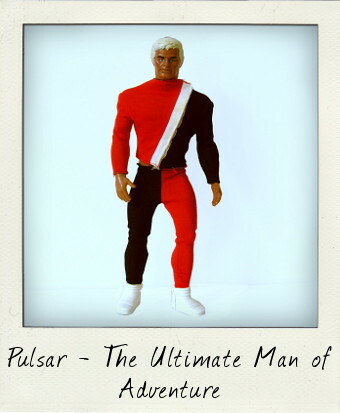 With Kenner wiping the floor with the competition with sales of the Bionic Man, Mattel certainly pulled out the big guns when they released Pulsar in reply. Whilst Steve Austin had a peel away rubber arm that revealed his bionic gubbins, Pulsar's entire torso was made of clear plastic to reveal his internal organs! Sounds pretty gross, doesn't it? Open the Velcro on his stylish two piece jumpsuit, press a panel in his back and watch as his lungs and heart pump simulated blood through his arteries and veins. A solidly built toy, my Pulsar's heart and lungs still pump just fine, although after over thirty years, the red goo that was used for blood has congealed and no longer flows. 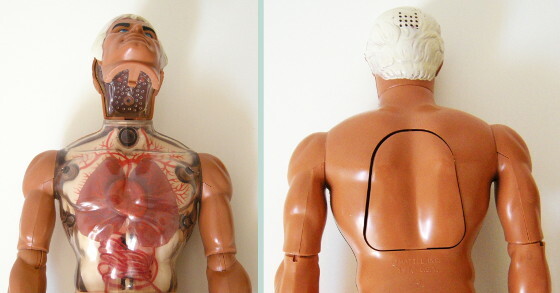 Pulsar - Press a button on his back to make his lungs and heart pump! There were actually two slightly different versions of the figure – with my Pulsar the clear section ends at the waist, with the groin area painted in a matching flesh tone with the rest of his body, whereas in the slightly less aesthetically pleasing alternate version, the entire piece is clear, revealing the inner connections of the leg joints. This later refinement was a welcome bit of attention to detail on Mattel's part. In today's ageist society it's somewhat curious to see a frankly middle-aged man as the model for this figure, with his white hair and decidedly older, but nicely detailed facial sculpt. As if watching his innards weren't enough, his face also slides open and one of two mission program discs can be inserted inside his head. Sadly, my Pulsar is missing his discs, so who knows what he's thinking!? And like all self-respecting action figures from the 1970s Pulsar also came with a playset - a Life Systems Center – plug him in and charge him up – not to mention a ready-made nemesis in the shape of a certain Hypnos. There was absolutely no back story provided so kids could invent what ever they liked about these figures! Utterly cool and more than just a little kitsch – I love this action figure! My sister of all people had a Pulsar when we were very young and i still remember playing with it until see got mad at me for playing with it for so long she took it away from me lol.